Turn down the drone section straightforward delay pedal function. 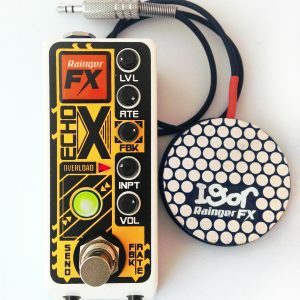 It’s a dub-flavoured digital delay (based on our Echo-X delay pedal), that also produces low, throbbing drones that can also be mixed through the delay circuit. If you play shoegaze, doom/heavy/psychedelic rock, or ambient music it’s a fantastic tool for making a powerful base note to play over. Maybe you play in a two piece band? Then it’s essential! You’re a solo electric guitarist making sonic textures?…. You improvise over an atmospheric backing? The Drone Rainger is for you! The guitar signal and the drone signal are independently mixed through the same delay circuit (about 1 second maximum repeat time), with a totally dry guitar switching option. 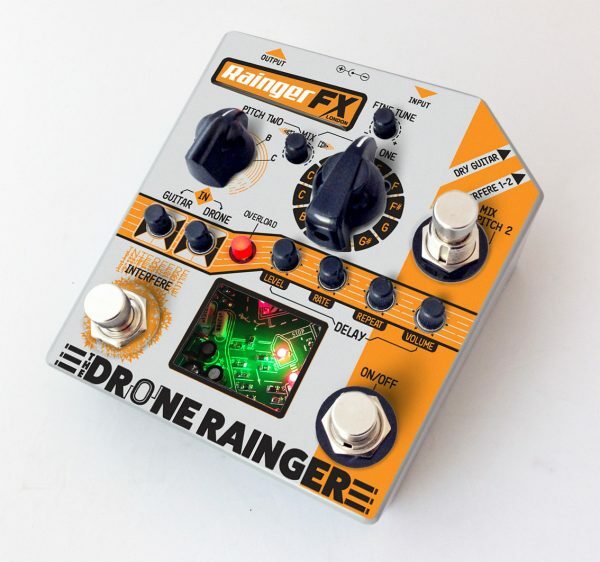 There are actually two analogue tone generators inside the Drone Rainger making up the sound – one with a 12-way selector switch, the other free-moving – so that when they’re tuned nearly the same, you get interesting ‘beats’ created between the two of them. Blend them to suit using the ‘mix’ knob. 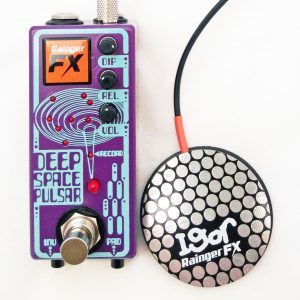 The drones also have two instantaneous effects that can be switched in with a footswitch while you play guitar; one is a ‘tone-down’ pitch dropping effect – making the pitch sag in a truly ominous way! The other is a ‘pitch-up’ effect, raising the pitch of one tone generator much higher – so that 2-note ‘chords’ are easily possible. It’s also possible to set the pedal to produce two separate notes – and to footswitch between the two while you play, which is extremely useful if the song you’re playing has a section with a different base note or a key change. And if you’re playing along to music that isn’t strictly tuned to pitch, you can adapt using the pedal’s ‘fine tune’ knob. Like all our stompboxes, it’s housed in a custom-designed enclosure – this one a distinctive desk-style with seven sides. The window in the main front panel is a window into the Drone Rainger’s soul – an aerial view of an industrial part of a city, complete with streets and cars, car parks and streetlamps, toxic chemical silos! A dystopian vision to match the powerful hypnotic sounds….. This is a truly unique pedal in many ways, that can be played as an instrument in itself. *Is the pedal true bypass? * Does this come with an Igor controller? 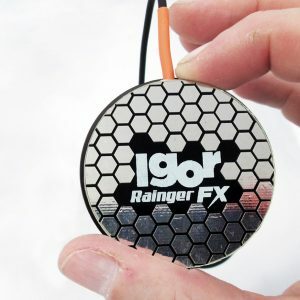 The Drone Rainger doesn’t have an Igor facility – all the foot-operated aspects are through footswitches mounted on the enclosure. *The parts that make up the city – are they actual working parts? Yes – that’s mainly the Overload LED circuit. *What is the delay chip used? *Can I change the speed of the chorus? *Can I put the chorus effect onto the guitar? *Can I turn the chorus off? No – sorry – you can’t. 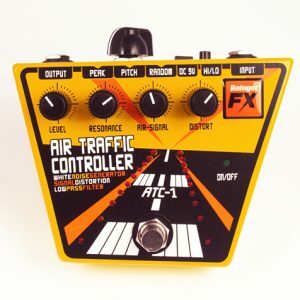 BTW an un-modulated tone into a delay circuit, once it settles down, sounds like…. just a straight tone – no echo! It’s the gently varying pitch of the note that brings out the magic in the delay repeats. *So I can tune my guitar to this tone! I don’t need a tuner, right? *What are the dimensions of the Drone Rainger? It’s 116mm high (at the ‘highest’ point) by 104mm wide, and stands up 66mm vertically.